Fair trade regulator the Competition Commission of India (CCI) has approved Reliance MediaWork's sale of Big Cinemas to Carnival Films. In December, Carnival Films Pvt. Ltd, backed by Kochi-based investor Shrikant Bhasi, signed a deal to acquire a 100% stake in multiplex operator Big Cinemas, an arm of the Anil Ambani-owned Reliance MediaWorks Ltd (RMW), for about Rs 700 crore. Big Cinemas owned 252 screens. The CCI is learnt to have mentioned the deal does not raise anti-competitive concerns. The transaction, structured as a combination of transfer of debt of RMW and infusion of cash proceeds, will reduce Reliance Capital’s leverage by approximately Rs 700 crore. The deal excluded real estate property owned by RMW at IMAX Wadala and other properties, which will be be separately monetised for an approximate value of Rs 200 crore. As per the agreement, Reliance Capital will have the option to acquire a pre-IPO (initial public offering) minority stake in Carnival Cinemas at an appropriate discount, upon eventual listing of the company. In January, Carnival also had acquired Stargaze Entertainment from Network18 Media, increasing Carnival's total number of screens at 330, close to the 361 screens of INOX. 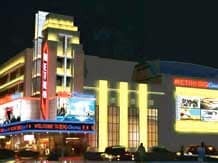 Stargaze operates multiplexes in various cities under the brand name Glitz Cinemas. The PVR Group remains at top position as India's largest multiplex chain with 454 screens.